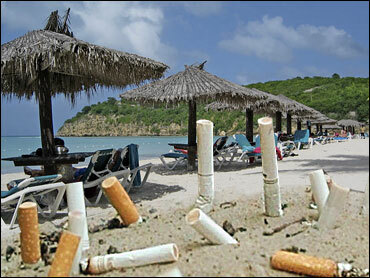 Cigarettes are still the biggest trash problem on the world's beaches, according to a group that picks them up. Of the 7.7 million pieces of debris collected in 68 countries during an annual beach cleanup day last September, cigarettes and cigarette butts accounted for roughly 1.9 million, The Ocean Conservancy reported Thursday. It's the sixth consecutive year cigarettes have topped the list. More than 350,000 volunteers removed about 7 million pounds of debris from 34,500 miles of coastlines and waterways, and ocean, river and lake bottoms. Coming in second at about 768,000 items were food wrappers and containers, which can be extremely dangerous to wildlife. "A plastic sandwich bag floating in the ocean may look like a jellyfish, a favorite food of sea turtles," said Sonya Besteiro, the cleanup project manager. "If a sea turtle ingests a plastic bag it may feel full and stop eating, which results in starvation. Or the bag could block the animal's digestive system and cause death." During the 2006 cleanup, volunteers found 1,074 animals entangled in debris such as fishing line and nets. Only one of those animals survived — a female seal found in Hobe Sound. Discarded fishing gear and plastic debris kill more than 1 million sea birds and more than 100,000 marine mammals and sea turtles each year, the conservancy said. Last week, an endangered Hawaiian monk seal drowned after becoming entangled in a fishing net off Oahu. In October, Hawaiian wildlife officials found a 5-month-old monk seal dead in another net. "With only 1,200 monk seals left, this is such a terrible loss," said Christine Woolaway, who coordinates the coastal cleanup in Hawaii, the state with the most threatened and endangered species at 329. Since 1986, more than 6.5 million volunteers in the project have removed 116 million pounds of trash from beaches and waterways in 127 countries, according to the Washington-based environmental advocacy group. The United States had the most participants in 2006, according to the report, with 182,100 people cleaning some 4.1 million pounds of trash from 10,550 miles of waterways and coastlines. Canada saw the second-best participation with about 26,550 people, followed by the Philippines where some 25,500 volunteers helped out. California and Florida saw the most participation in the U.S., with about 56,000 and 28,000 people participating, respectively. The two states collectively removed about 1.5 million pounds of debris over 4,600 miles of shorelines and waterways. This year's cleanup is set for Sept. 15.